Which character should you choose? With eight characters to choose from at the very beginning of the journey, Octopath Traveler seems daunting at first. Although your initial pick will influence the first few hours of the game, you will be able to recruit other party members as you progress with the campaign. To help you make that first crucial decision here is a quick breakdown of each hero with their given class description, followed by a detailed rundown of their strengths and weaknesses. 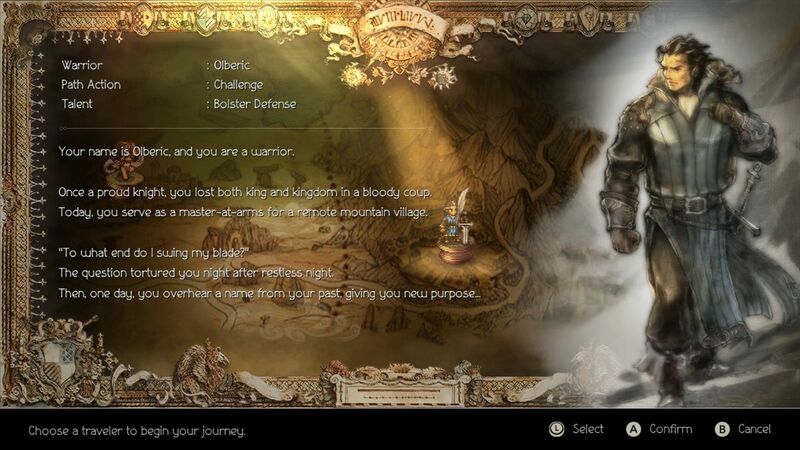 Before you dive in, you may want to familiarize yourself with terms like boost and break in our Octopath Traveler beginner’s guide. Alfyn seems weak on the surface, but he’s incredibly resilient thanks to his alchemy skills that translate to easy frequent healing in the early game. His mixing abilities require a little more studiousness. Just because Alfyn is an apothecary doesn’t mean he can’t tango in combat. Alfyn’s biggest strength is that he starts with a cheap healing spell in first aid, which merely drains SP (skill points) instead of consuming an expensive item. In addition to healing in combat, players can also opt to restore health in the pause menu with first aid, an invaluable tool during Octopath Traveler’s long dungeon crawls. Although you can ignore it initially, after the first few hours you’ll need to take note of Alfyn’s most unique ability: concoct. Alfyn can mix multiple items together to create new materials, which can both cure your party or deal damage or status effects to enemies. 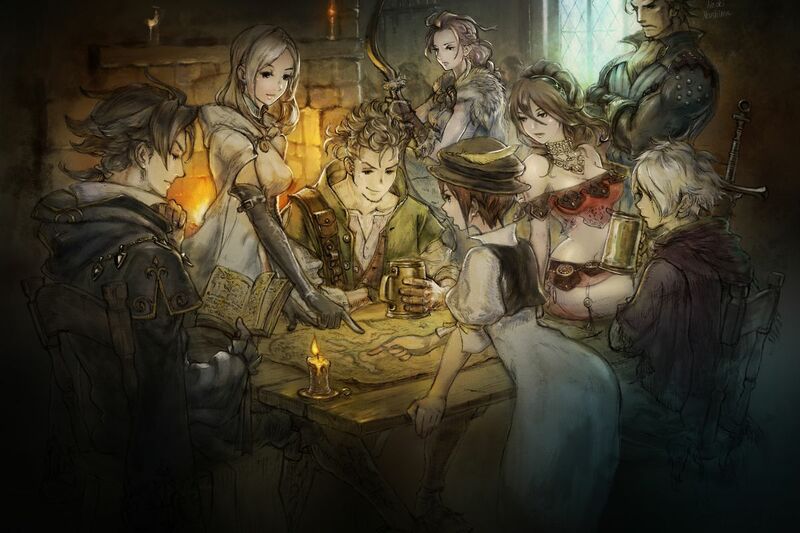 The catch is that Octopath Traveler will not actually tell you what the mixture will do until you make it for the first time, which can be dangerous in a hectic battle. Our recommendation is to spend around 10 minutes in the starting zone in easy combat situations (near town) concocting mystery potions. That way, when you hit your first boss battle you’re ready to go with a handful of new identified items. Cures a single ally of all status ailments and renders them immune to further ailments for two turns. 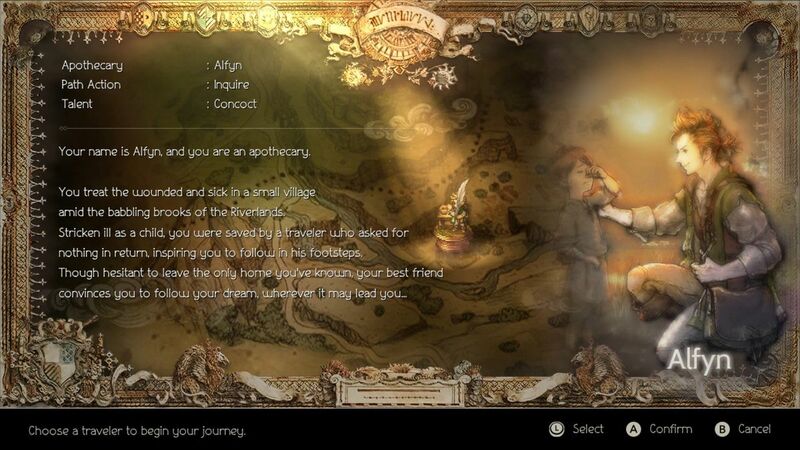 Alfyn has access to one of the greatest status effect cure spells in the genre in just under an hour of play. Not only is rehabilitate invaluable for the first boss’ poison, but it also shields you from status effects for two entire turns. Grab it immediately. 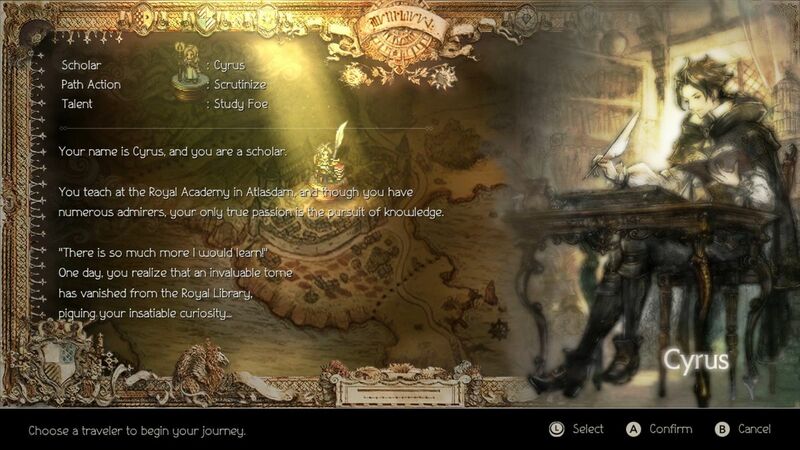 As one of the more unique choices in Octopath Traveler, Cyrus the scholar will suit players who prefer logic puzzles and franchises like Professor Layton. In battle, he also starts with at least one advantage over most spellcasters in that he can identify enemy weak points at the beginning of combat. As a result of his high damage spells and his aforementioned weakness identification, Cyrus is the easiest mage to start with in Octopath Traveler. 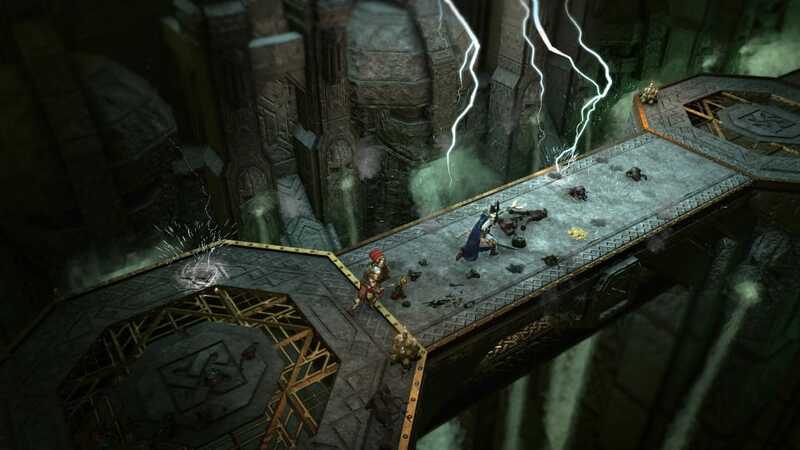 Right at the beginning without having to do any guesswork, players will understand what can break their foes, which goes a long way in avoiding damage altogether: It’s a useful skill when running through lengthy dungeons. Just be careful not to take too much damage and pack plenty of healing items, as Cyrus is one of the most frail starting characters in Octopath Traveler. Reveal the HP and one weakness of a single foe. Cyrus has no problem stunning enemies constantly, given that he can scan two weaknesses in just one turn. He gets his passive ability immediately, and then you can cast analyze to see what you’re dealing with. As a purveyor of pets and summons, Octopath Traveler’s H’aanit is an unconventional heroine that can dish out tons of damage upfront. H’aanit is very similar to Olberic the warrior in that she’s simple to learn, but requires a little more micromanaging with her pets. H’aanit is another character that’s best suited for long term JRPG players. She has the most amount of starting abilities in the game, juggling bow and axe attacks on top of beast lore summons and hunter skills. Add the power to capture enemies to use as future limited summons and you have yourself a web of choices. With all that responsibility comes power. H’aanit has it all. She can strike at a variety of weaknesses as well as heal herself by way of the mossy meep summon right away. About all of that summoning micromanaging: if you’re confused as to what an enemy is called (when deciding whether or not you already control a specific type of enemy as a summon), you have to select them while attacking. An enemy’s name won’t be displayed by default. Attack all foes 5-8 times with a bow. H’aanit lacks the ability to reliably take down a group of enemies at once and arrowstorm takes care of that weakness. Rain of arrows can hit multiple enemies but it’s randomized: Arrowstorm eliminates chance from the equation. As a fighter through and through, Olberic’s main ability in Octopath Traveler involves challenging people to duels for additional training through leveling. He’s the most straightforward character in all of Octopath Traveler in that he relies very little on spells and leans on simple combat strikes. Because Olberic can pick fights, he doesn’t have to rely on grindy leveling in dungeons to get ahead. 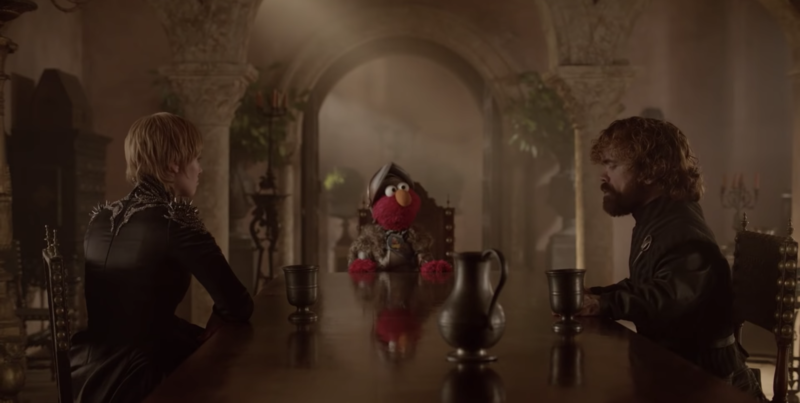 He also starts with a hefty amount of health and defense, ensuring that the first dungeon won’t beat you down quite as much as it would with other characters. Olberic mainly just dishes out damage. If you brute force most of the standard enemies in the game you will kill them, even if you aren’t exploiting their weaknesses. He’s the perfect starting choice for newcomers to the genre as future party members will bolster his faults with spells and healing when the game gets tougher. 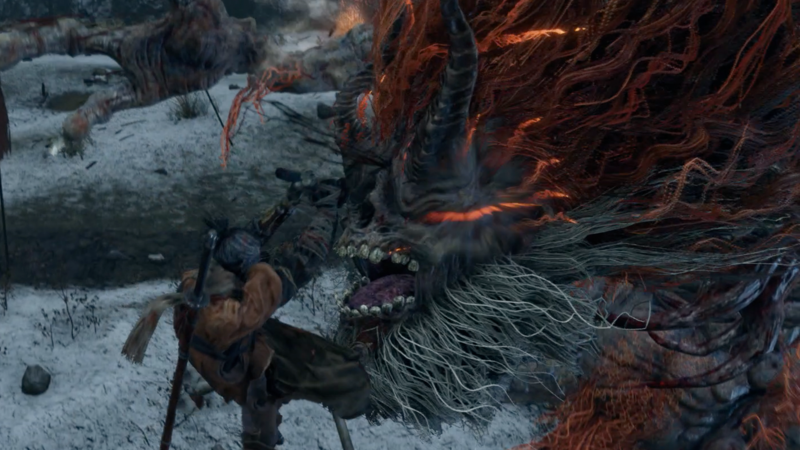 Unleash a sword attack on a single foe. Olberic excels at raw damage to single targets and cross strike is the easiest way to facilitate that strength. When fully boosted, it can take out enemies in one hit. As one of the select few that can heal right out of the gate, Octopath Traveler’s Ophilia is a decent choice for a starter character. Her damage is slow going and mostly relies on her starting holy light spell. Just like Alfyn, Ophilia begins with a healing spell, but she has even less to manage. She doesn’t have any fancy combination or item effects: She relies on the power to heal herself in and out of combat and deal limited magic damage. Ophilia’s one starting combo is cane smack, cane smack, cane smack, boosted holy. Starting with Ophilia isn’t especially taxing in terms of complexity, but it’s not recommended. She’s the perfect character to pick up later on someone else’s journey because most of her skills involve bolstering a group while she remains vulnerable. Deal light-based damage to all foes. Ophilia has more than enough healing to take care of herself. Although her revive and greater healing (heal more) abilities are useful later on as you acquire more party members, you really want to maximize Ophilia’s damage against groups to fix her greatest initial shortcoming. Primrose’s ability is a little strange. She can recruit humans as party members with her allure ability, which can sport abilities that aren’t explained until you actually use them in a fight. Her dancing powers require setup and are better suited for more experienced RPG players. 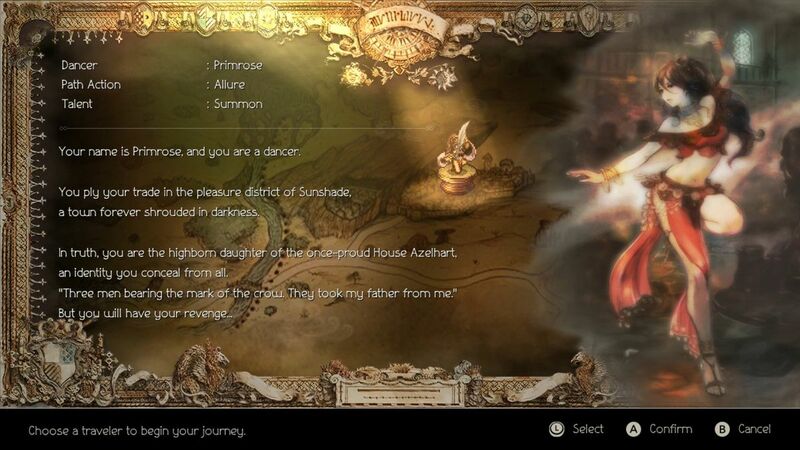 Octopath Traveler’s Primose is not a beginner friendly character. Her dancing skills, which debuff (inflict negative status ailments on) enemies require planning, as they only work for a limited amount of time. If you spring for a dance early without setting up your offensive abilities first, you’re going to waste precious SP and time. An easy way to practice that setup is to gain two boost levels, use a debuff, then strike an enemy weakness with a triple-boosted power on the next turn. With little to no party utility, Primose is a character you’ll want to pick up after getting several other heroes. Once you have healing and defensive skills taken care of, you can unleash Primose as one of your primarily enablers for other heroes. Deal dark damage to all foes. 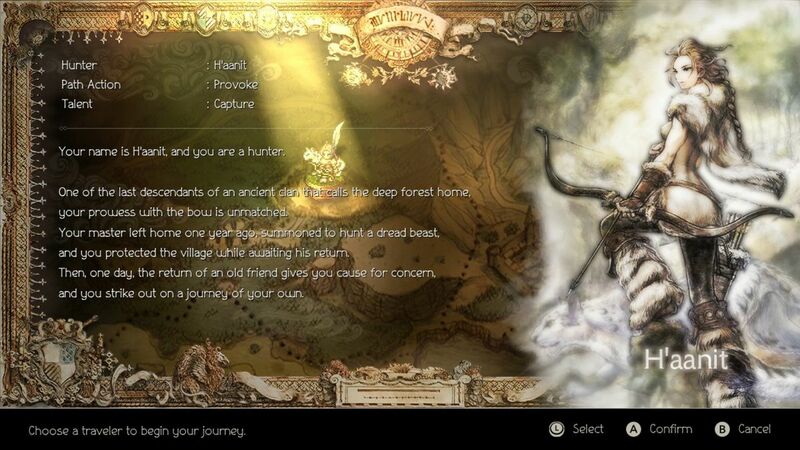 Like several other characters, Octopath Traveler’s Primrose needs more tools to be able to strike every enemy at once. A triple boosted night ode can soften up a weaker group, which makes for easy experience farming early on. Dark damage is also hard to come by, so giving her more chances to use it in a group setting helps play to other party members’ weaknesses. 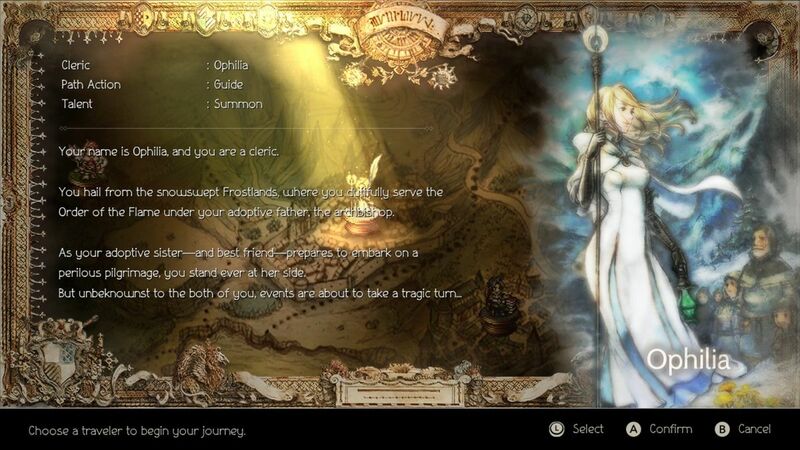 Many of Therion’s abilities do not directly benefit the player upfront. Stealing items and equipment is useful, but in the early game he can be hard to get a handle on. Lifting items from townsfolk (even in the very first zone) can be fun. But you’ll often find that Therion’s plunder doesn’t actually benefit him, as he can’t use some of the weapons or armor he acquires. Stealing is a long game in the sense that many items you’ll be picking up will benefit your future party a few hours into the story. To exacerbate this hangup, Therion’s first boss is extra challenging due to his large HP pool and defensive skills, so you’ll need to pack extra healing grapes before the encounter. Or you can level-up to four and grab HP thief. Attack a single foe twice with a dagger and steal HP equivalent to half of the damage dealt. 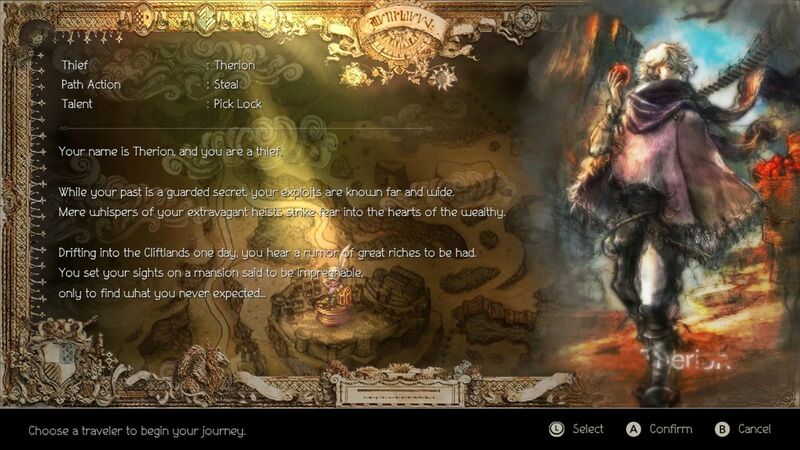 This one is a no-brainer for Octopath Traveler’s Therion. He can’t heal at the start, but for a low SP cost he can now hold his own in solo combat without having to rely on costly items. If you’re going into the first boss battle without HP thief, pack at least 10 healing grapes. While you’d expect a merchant to exemplify a low key fighting style, Octopath Traveler’s Tressa actually begins her journey with wind magic and an abundance of items. 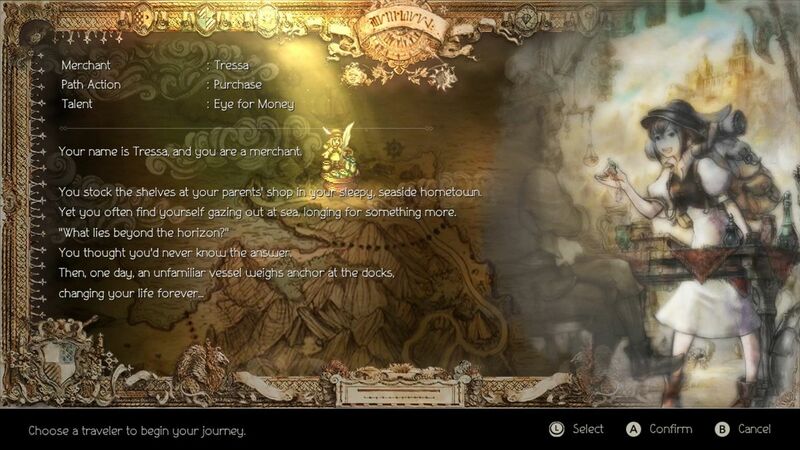 Play Tressa if you love looking at screens often and haggling for the best deals. She can grab a ton of useful healing items and herbs that can deal with nearly any status effect immediately. Before you visit the traditional item shop, stop at every NPC and investigate them using her innate merchant ability to see if they’re selling a cheap existing item or a completely new one. Tressa is very beginner friendly due to one of her earliest abilities, rest. Like Ophilia, she doesn’t hit hard and requires some patience to get through lengthy battles, but her resilience will eventually win out as she doesn’t require a heavy amount of SP. Restore one’s own HP and SP and cure status ailments. Rest is one of the best skills in the entire game. You can’t use it out of combat, but you can heal yourself for a zero SP cost in a pinch. It pretty much guarantees solo victory unless you get caught with low health at the start of a fight or get completely overwhelmed by damage in a boss battle. This Article has a component height of 98. 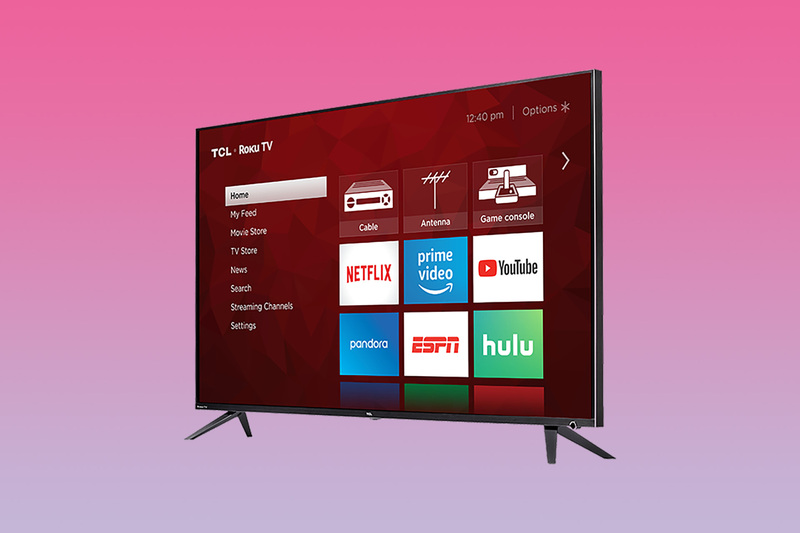 The sidebar size is long.